Part of planning for a new restaurant budget is understanding expenses. There are the obvious expenses such as food costs and labor, and then there are all the other expenses that need to be considered, such as marketing, utilities, equipment upgrades, capital improvements, and supplies. Some costs are fixed, such as the lease, mortgage, or salaried wages. Other costs fluctuate, including hourly wages, utility bills, or the cost of food. There are also the unanticipated costs, like a broken piece of equipment or food spoilage in the kitchen. 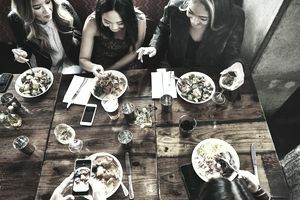 As you create a budget for your new restaurant, including each of these costs will help better plan overall management and help avoid future financial trouble. Fixed expenses are those that don’t fluctuate from month to month. Mortgage, rent, loan payments, salaried labor are all the same each month, making it easy to budget. Other fixed expenses include insurance premiums, license fees, and membership fees or dues (such as your local chamber of commerce or small business association membership fees). Some fixed expenses only need to be paid once a year, but keeping them in your budget will prevent their being forgotten. A good portion of restaurant expenses is fluctuating costs, including food prices, hourly wages, and utilities. During the start-up phase of a new restaurant, it can be hard to predict these fluctuating costs accurately. However, after a few months, or even a few weeks, you should be able to budget better for these costs, based on your restaurant sales. Food and labor are the biggest expenses for any restaurant. Rather than looking at hard numbers, focus instead on percentages. For example, instead of saying that the weekly food order won’t be more than $5000, instead, say it won’t be more than 30% of your weekly sales. The same is true of your labor costs. Generally, labor should also be less than 30% of your restaurant's total revenue. Inevitably, there will be some weeks when the sales dip and costs remain the same or rise slightly, bringing up those percentages. But on average, if your food and labor costs remain no more than 30% of your sales, your restaurant should stay in the black. It may take a few weeks or even months to see a trend in average weekly sales, so be vigilant about tracking how much you are spending in those early days. If you find that your costs are rising, without the corresponding rise in profits, it’s time to make some changes. Cutting back on payroll or your food order are two ways to save money immediately. Of course, you need both good service and food supplies to stay open, but trimming down each of these costs can help just enough to lower expenses back below 30%. If you are not the person doing the kitchen order, ask to review the order before submitting it. Same with the staff scheduling. You may find some shifts that are overstaffed. Managers aren’t always as prudent with money as the actual restaurant owner is. There are other areas within a restaurant to monitor as well. Is the kitchen staff utilizing the entire food order, or is food being thrown out? Reducing spoilage in the restaurant kitchen will help save money. If you are outsourcing certain jobs to outside vendors, can you save money by doing it yourself? Or vice versa—are there jobs in your restaurant, like laundry, that you are paying staff to do, which would be cheaper to outsource? It’s also important to remember that costs will vary depending on the type of restaurant you are operating. Labor costs for a food truck will be far less than labor for traditional brick and mortar family style restaurant. ​Food costs will be more at a fine dining establishment than at a burger joint. That’s why focusing on a percentage rather than a dollar amount is helpful when planning a restaurant budget.